Immigration has become a seriously tainted word, hasn't it? By using it here I'm not seeking gratuitously to offend you, especially after the UK referendum where it played such a controversial part, though I am, of course, trying to catch your attention. In fact, I'm not talking about human immigrants, who don't usually want to leave their homes but are forced out by adverse circumstances. The immigrants I have in mind spread willingly, enthusiastically. Not only that, these immigrants, unlike most human ones, really are pernicious. To find out about these immigrants and why I'm showing you a picture of a dead palm tree, click here. 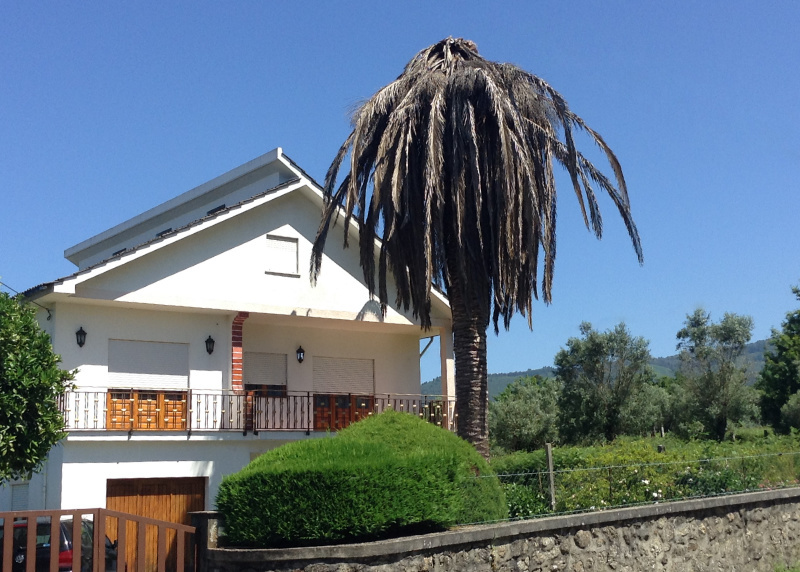 The umbrella-like palm you can see in the photo is one of many thousands in Portugal that have succumbed to the predations of the red palm weevil, rhynchophorus ferrugineus. Native to south east Asia, this insect menace has spread north and west to areas where it has no known predators. For years it has been devastating date palms in north Africa, and now because of lax regulation in the importation of plants, it has spread to many different kinds of palms around the Mediterranean basin. It is thought that it entered neighbouring Spain in 1994 through imports of trees from Egypt but unfortunately the seriousness of the infestation wasn't realised quickly enough. Figures aren't easy to come by but in Andalucia 10,000 trees are known to have died in the first eight months of 2008. Given that the beetle can fly for distances of up to 8 kilometres, there was no chance that they would not spread to Portugal. Most affected trees, of a variety called called the Canary Island Date, are in the Algarve, where it is widely used by municipal authorities on parkland, roadsides and golf courses and by individuals to enhance their gardens but the example in the photo is in the Alto Minho, almost as far north as it is possible to be in Portugal. What is this unwelcome migrant like? The red palm weevil is about the size of a cockroach, between 2 and 5 cm long, and is usually a rusty red colour though many variations are found. The larvae are plump and white with a darker head and powerful jaws which they use to chew up the inside of the tree. Eventually they build a pupal case either on the outside of the tree or in the detritus at the base of the palm. There they metamorphose into the adult beetle. 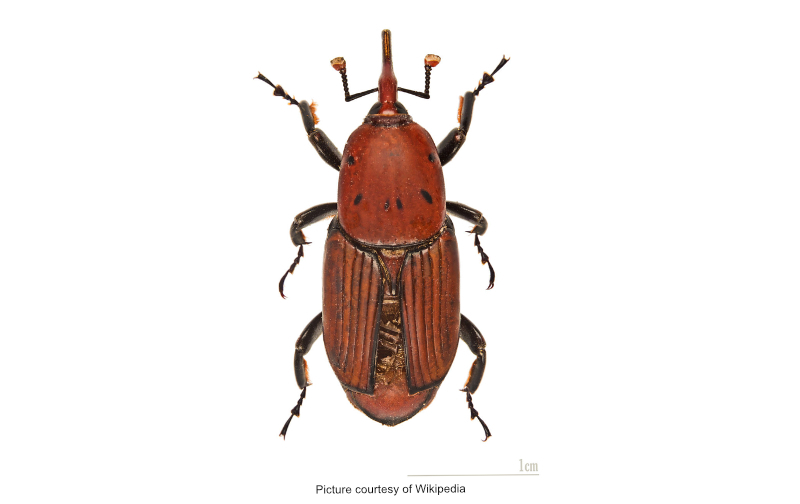 How does the red palm weevil destroy palms? The adult weevil lays its eggs in a suitable palm, entering either through the crown or a wound in a leaf or the trunk. The female typically lays a couple of hundred eggs and when the larvae hatch they eat the tree from the inside, damaging the vascular tissue by creating burrows as much as a metre long. When there are large numbers of larvae in a tree it's actually possible to hear them munching if you put your ear to the trunk. They then pupate and when new adults emerge, they fly off to seek new palms to colonise. The first sign that a palm tree is in trouble happens when either misshapen leaves appear or the fronds on the crown begin to yellow and wilt. By the time the damage is visible, the tree is already in dire trouble and may be impossible to save. Prompt action, however, can save some. The usual treatment entails spraying affected palms with insecticide, though spraying is not enough. It may only weaken, not kill the larvae so the nest needs to be located and holes drilled in the trunk to create pipes which can be filled with insecticide. Ingesting poison as the larvae munch the wood will kill the growing beetles and if some of the vascular structures in the centre of the palm are left, it can recover. The treatment needs to be repeated regularly, however, as wounded trees give off a scent, known as a kairomone, which attracts more weevils. Unaffected trees must be regularly sprayed to protect them. The cost is around €20 a month for a single tree, though there are economies of scale where many palms are found together. In heavily infested areas costs can be much higher due to the necessity of frequent and on-going spraying. For many home owners this is a considerable expense but to keep the palms it would surely be a price worth paying. Israel, for example, has all but eradicated the pest through effective treatment of their palm trees. What else can be done to reduce the spread of the weevil? Other actions which will reduce the populations of red palm weevil include setting up traps. Packets which exude a combination of a kairomone, the smell from a wound on the tree, and a pheromone, the scent of a female beetle, will lure the weevils to buckets part filled with water where they may drown. Releasing sterile males can also reduce populations but what really counts is political will and over the recession that hasn't always been evident in Portugal. Of course it's easy to criticise when austerity has to be implemented under EU rules and money is so very short: saving trees may come low down on a government's list of priorities. Considering, however, the costs of removing and incinerating dead trees and then replacing them with new ones perhaps the government could be persuaded to subsidise preventive treatments. People in the Algarve can pay €30 or more for a weevil trap which in India sells for a tenth of the price and in Jordan for even less. Alternatively, perhaps the palms must be abandoned as a decorative tree and other indigenous, more resilient trees used in their place. Just as in the UK our landscapes are different from those of my childhood since we have lost virtually all our elms and are now losing many of our ash trees, Portugal's countryside will change too in ways that will make it unrecognisable to many older generation Portuguese unless both government and individuals take responsibility. And, when it comes to immigration, let's decide which sort really does affect our lives adversely and, instead of being xenophobic, why don't we all work together for the common good? Hi Liza, How sensible of the Omanis to restrict plant movements. It is interesting to read of other places where this problem has occurred. The import and export of plants is a subject that requires much thought and careful regulation. We tend to think of animal invaders causing problems - e.g. grey squirrels and mink in the UK - but plants can also be a serious nuisance. This is not only because they themselves may be undesirable but because of the parasites and fungal disease they bring. Yikes . . .not good. It is the Ash now under threat here in England, but I don't think there is a solution for it just yet. I think you are right the economics will be one of the biggest barriers for the government, and whilst there are as you have identified cheap solutions they are not going to take action until they are encouraged to do so. And as the oil projects in the Algarve highlight an awful lot of pressure has to be brought to get them to respond. Suspect may need 'human immigrants' like yourself to create sufficient well of concern for them to take any notice. I see you write about the Algarve so maybe you can raise awareness too. I think that the more people make a noise about the loss of the palms the more likely it is that something will be done. For the Algarve itself I imagine that it is economically important that the roadsides, golf courses, gardens etc. look attractive for the tourists who are the mainspring of the economy down there. However, it would be really good if the Portuguese themselves took the cause to heart: pushy foreigners can be annoying and counterproductive. Mind you, I do try, as I'm sure you also do, to be understanding about the financial problems Portugal faces so that I don't alienate those whose support matters most. Thank you for your comment and best wishes for your blog.